Nothing beats childhood memories when you’ve tried screaming at the top of your lungs trying to be a Super Saiyan like Son Goku from Dragon Ball Z. A timeless anime series had made its comeback with a nostalgic confrontation of Goku against the series’ most notorious villain, Frieza, in Dragon Ball Super where our hero had, again, attained a new form. 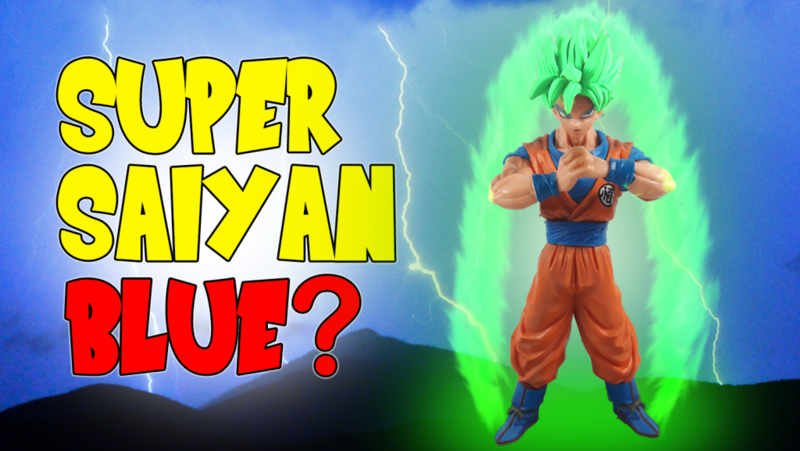 When we thought that Goku had already reached his peak with Super Saiyan God, that’s where we were wrong as Super Saiyan-ception happened when Goku reached the Super Saiyan form of Super Saiyan God – the Super Saiyan Blue! 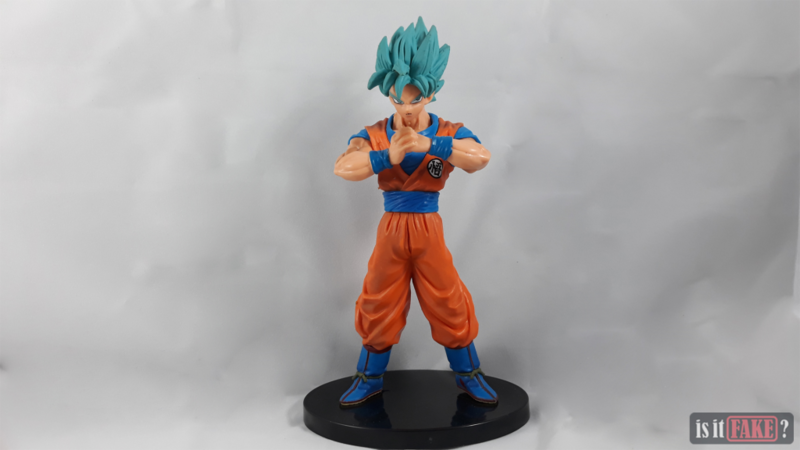 Unlike the wrathful Super Saiyan form, Super Saiyan Blue Goku is surrounded with a calm stream of energy ready to go full combo against all who tries to destroy Universe 7. From all the universes Goku has gone to, there’s one that the Grand Zeno could not erase. A universe full of pirates and bootlegs. 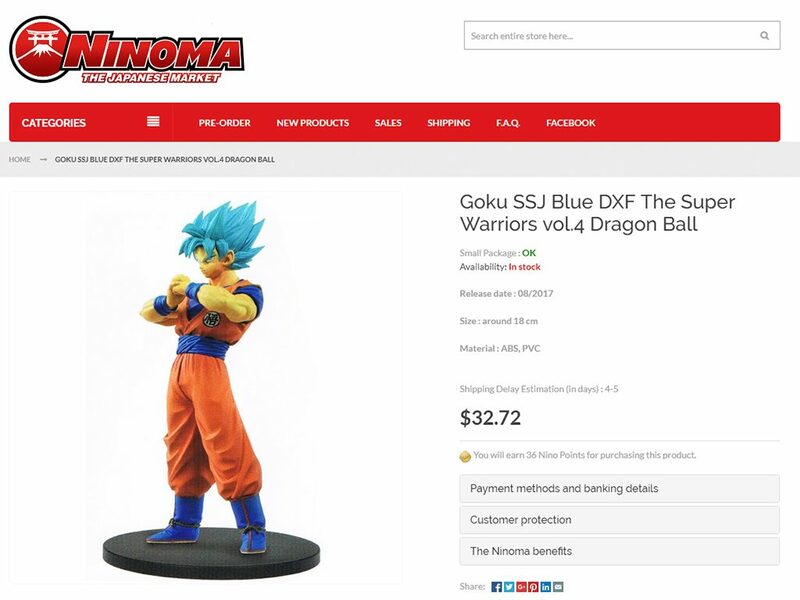 A universe where a fake Super Saiyan Blue Goku exists to satisfy the greed of these despicable bootleggers. 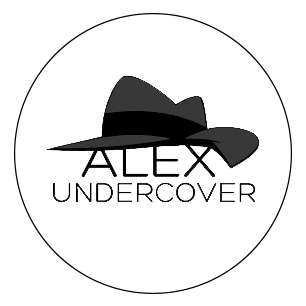 We have yet another weird store name from the abyssal depths of AliExpress. By weird, we mean that the vendor looked like they put random words together and sold toys. Probably, what’s next to weird is a sketchy inventory that would be fake items. Of course, AliExpress do give a satisfying service by shipping products worldwide. However if it comes to shipping counterfeit items, it can also be the most horrifying experience. 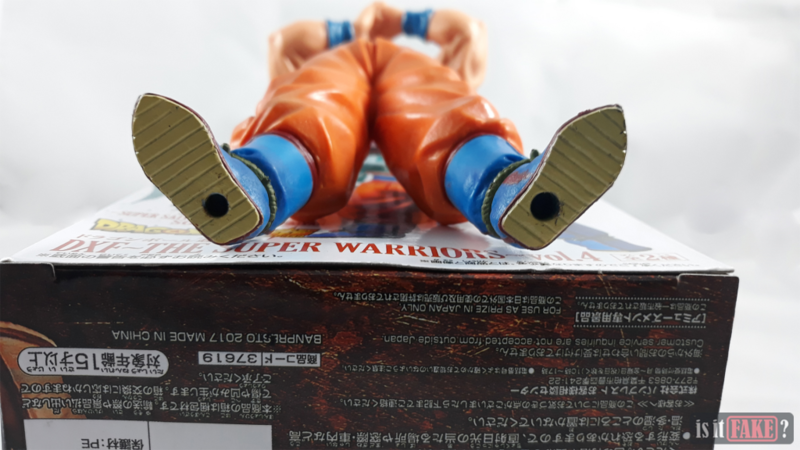 Imagine a lot of disappointed Dragon Ball fans out there who ordered from floatinthetoy store. 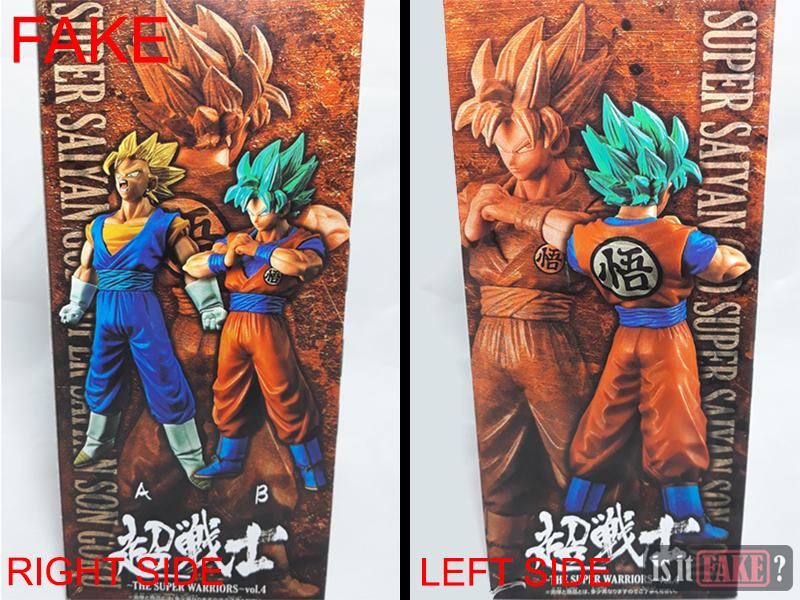 It’s credits to Banpresto for making DXF figures and if you haven’t seen a logo of Banpresto in a DXF figure box then it’s most probably a fake. The fake DXF figure came with a box though already unsealed, folded and the figure separated. 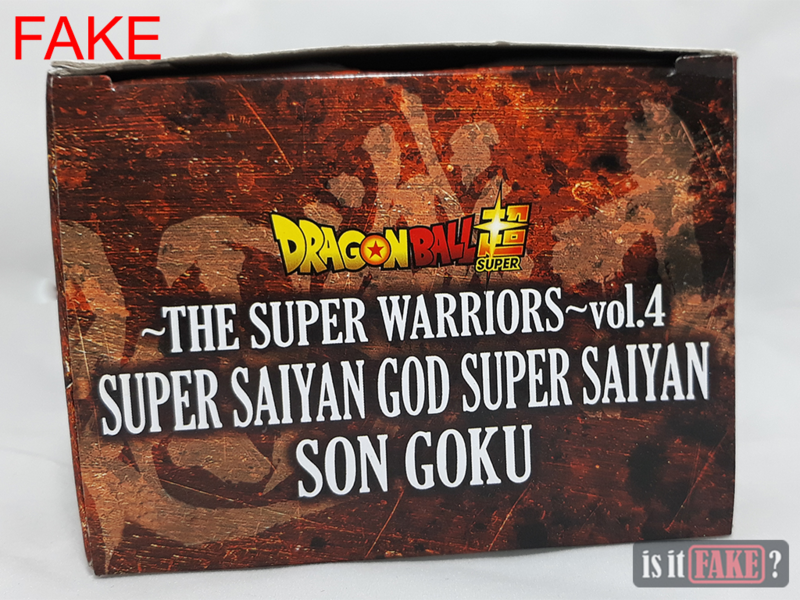 The box features the Goku Super Saiyan Blue DXF figure from the collection, The Super Warriors Vol. 4. From the looks of it, it’s almost exactly the same as the real box. 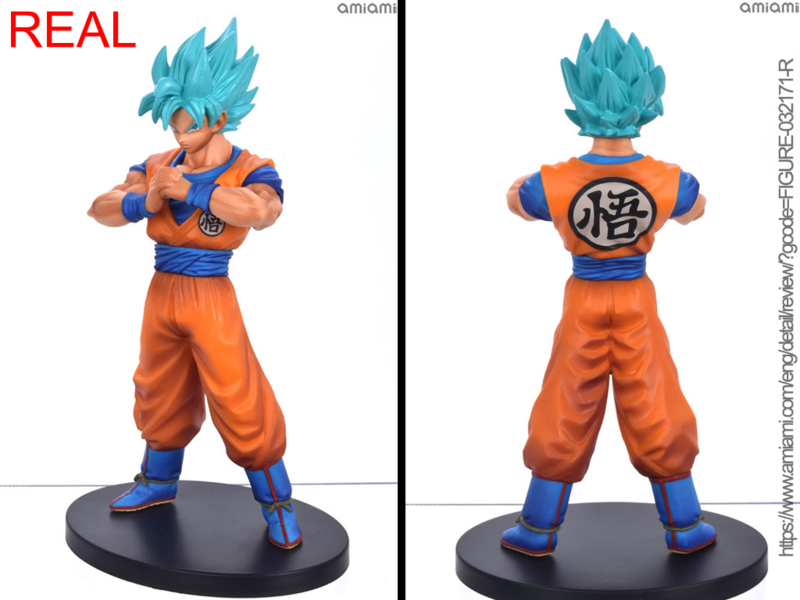 However, we will have to point out that there’s no Banpresto logo and on top of that, the Crane King as well as the DXF logo are also missing. 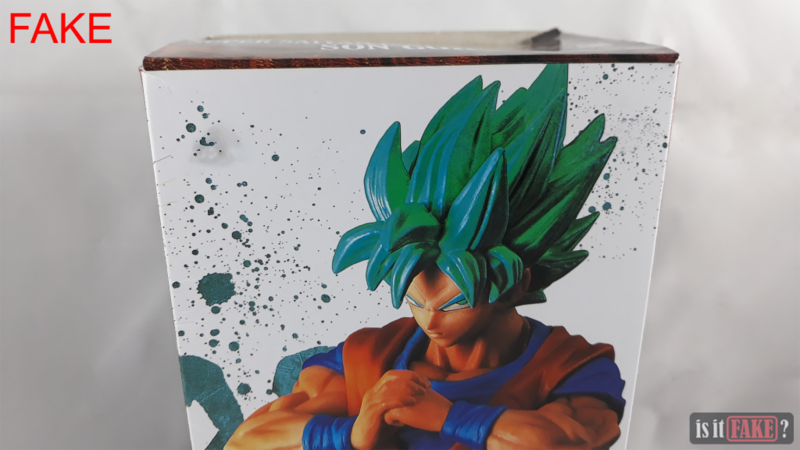 Since this product is licensed by Toei Animation, there should be a Toei sticker or seal on the box proving that the manufacturer is allowed to make products from their characters or other creations. Since the box was folded when it was shipped, it already looks dilapidated. The box also seems to be made from cheap cardboard material. Apart from that, there’s something off about the printed cover because of its odd color details and low resolution print. The figure itself wasn’t inside a box but it was sealed in a thin plastic together with its stand. Observing from head to toe, the figure feels like it’s the real one. However, the flaws of a fake figure can’t hide its true nature. 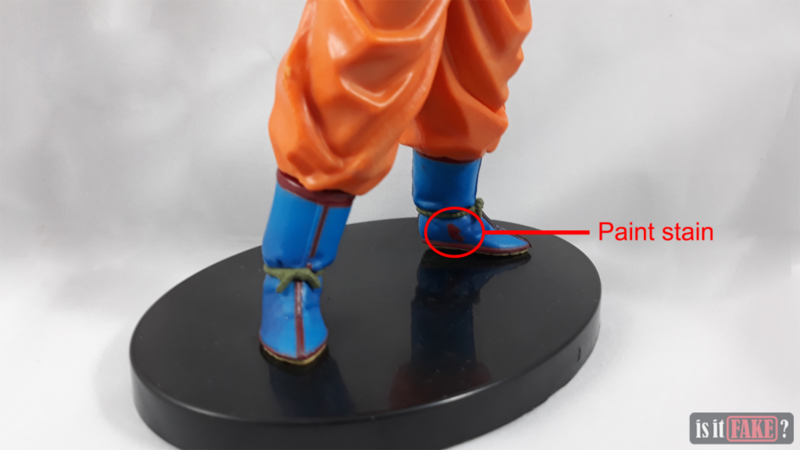 It’s possible that a real figure would have defects that is why manufacturers have customer support pages ready to assist fans with their issues. Though if you’re asking them for help with a fake, then you’re in for a rough roller coaster ride. 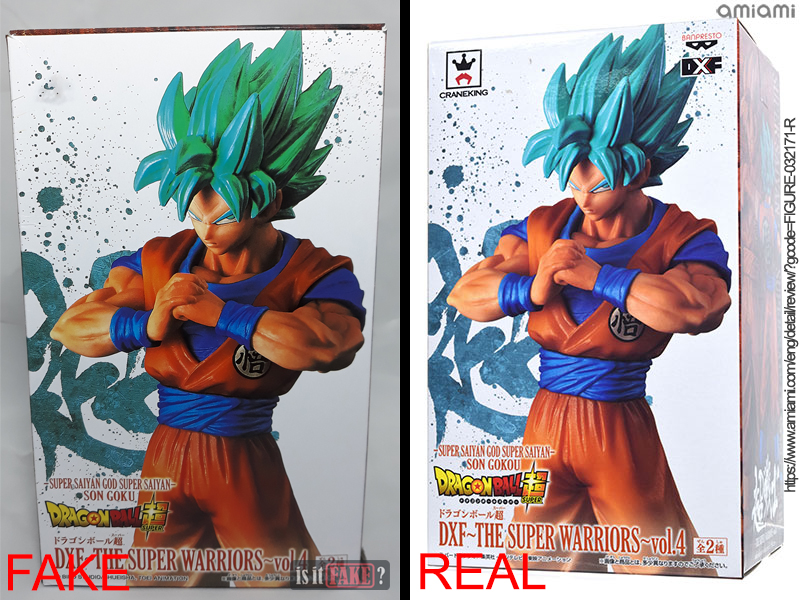 The fake Goku Super Saiyan Blue DXF figure from The Super Warriors Vol. 4 doesn’t come very far from the real one. It’s truly spot on with deceit looking at its pose, sculpt, and even its eye direction. However, noticeable defects come from meticulous observation as what would appear like a bruise on its right arm and its back. 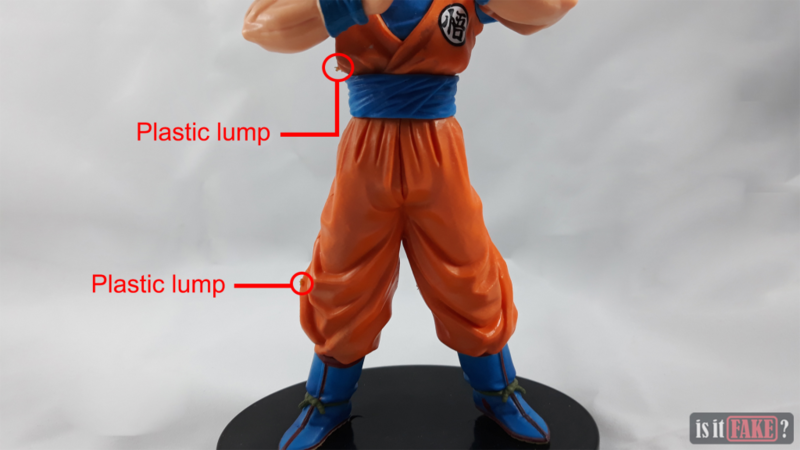 In addition, PVC plastic lumps can be found all over its body as if there wasn’t enough time to polish the figure. 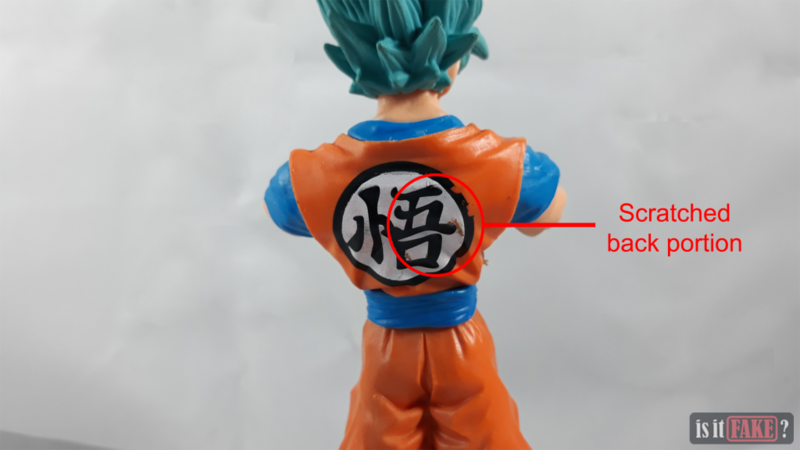 And if that doesn’t tick you off, you might not have noticed the scratched logo at the back of Goku’s uniform yet. Of course, what fake figure wouldn’t have any stains to give away their inferiority – obviously, not this one. 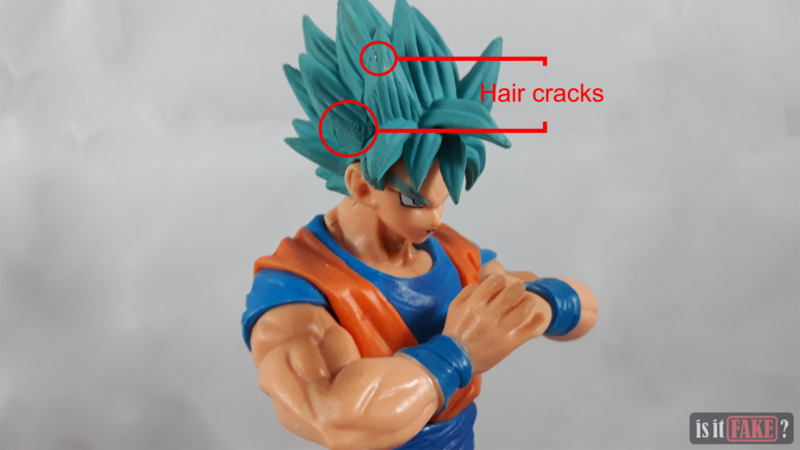 Aside from the noticeable flaws, the figure’s hair feels like it was bathed with high-class toxic paint as it feels rough and reeks of hazardous odor. The plastic where it was sealed smelled like a clogged container of waste that penetrates your whole respiratory system. Indeed, it’s an awful experience to handle this figure. It’s completely unknown what materials this fake figure was made from but one thing for sure that it’s evidently bad for your health. 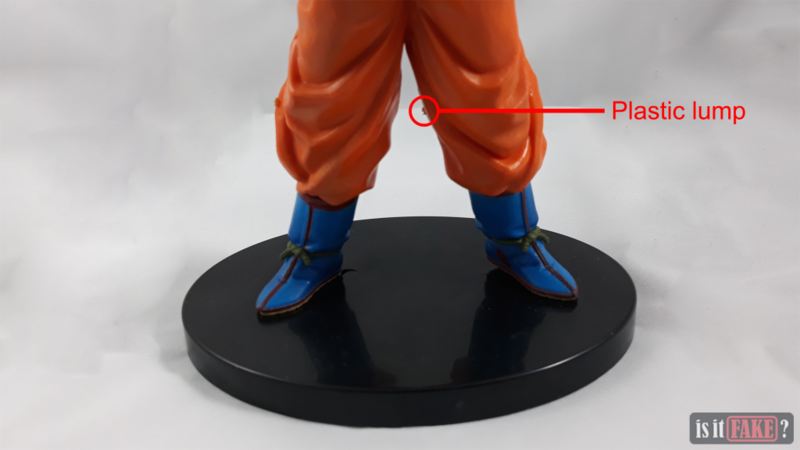 More flaws come afloat by looking at the fake figure’s soles making it hard for the item to use the base stand. A mishap like ignoring to carve the figure properly would result in a problem like this. 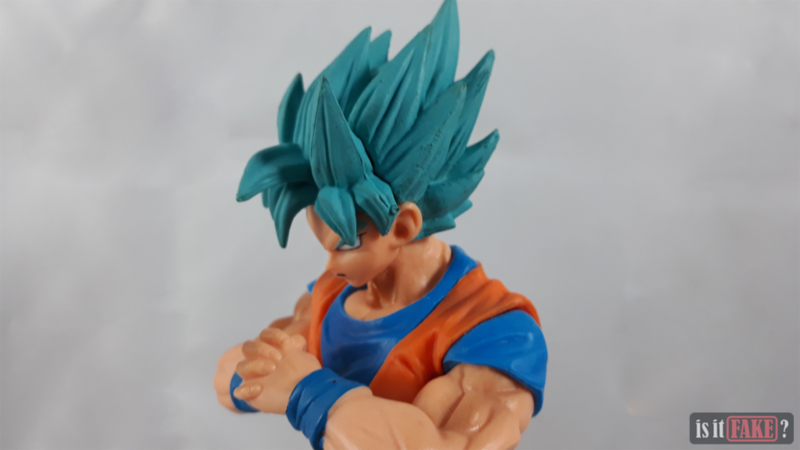 An authentic Son Goku Super Saiyan Blue The Super Warriors Vol. 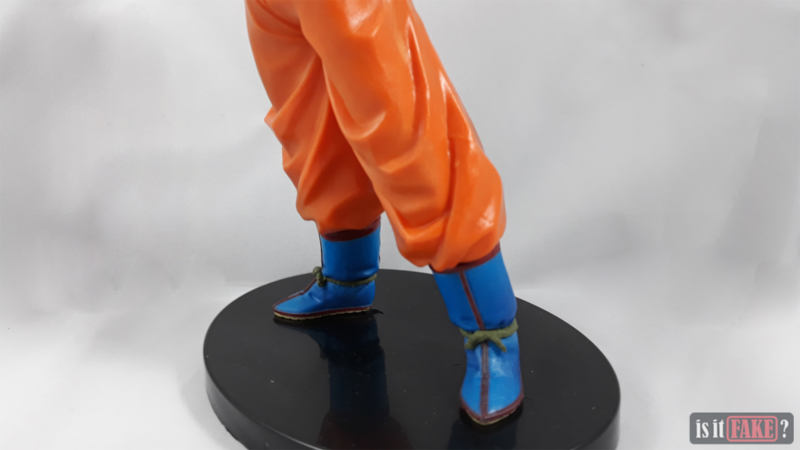 4 DXF figure made by Banpresto would have a polished finish, an accurate sculpt, and a perfect detail according to the brand’s standards. It’s the real figure that you’d want in your glass cabinets. 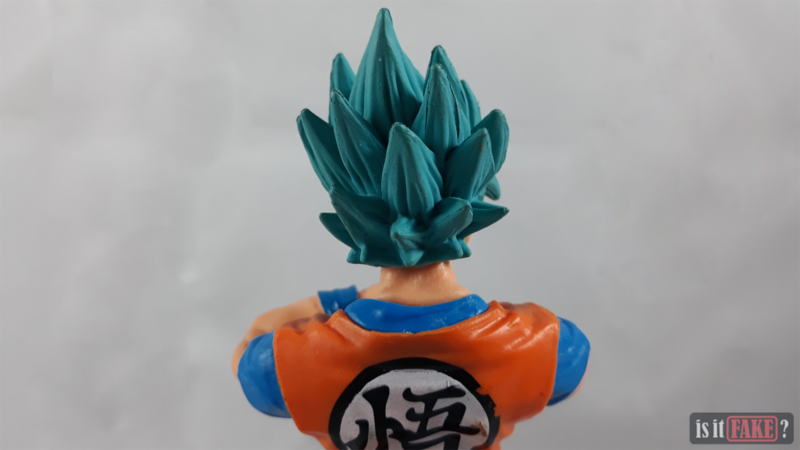 A high quality figure, indeed, doesn’t come as cheap as a bootleg figure like this lackluster Son Goku Super Saiyan Blue DXF figure. However, price comes with a good addition to one’s collection as well as a good experience being collector ourselves. 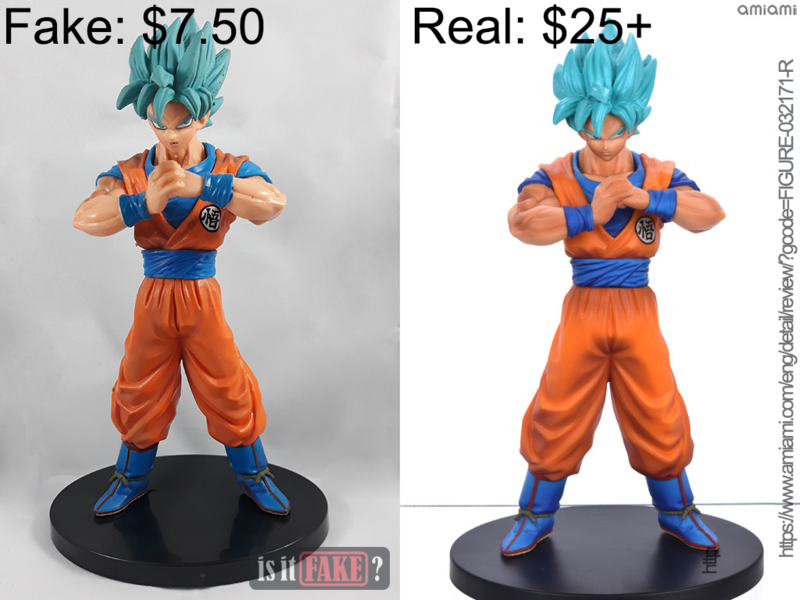 Paying $7.50 for a fake figure that’s bathed in toxicity is never worth it. 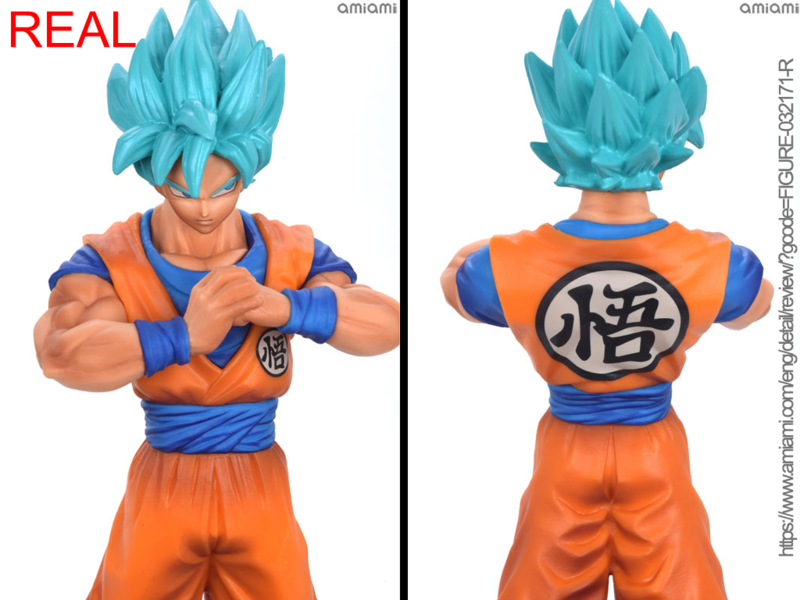 Sure, you’re going to just display it anyway but you’d have to go out your way to wear a hazmat suit for the fake Goku Super Saiyan Blue DXF figure. Settling for a $25.00 authentic figure is, without a doubt, a good value for your hard-earned money. Who knows, authentic figures tend to vary in prices because they have a reasonable resale value. Since The Super Warriors Vol. 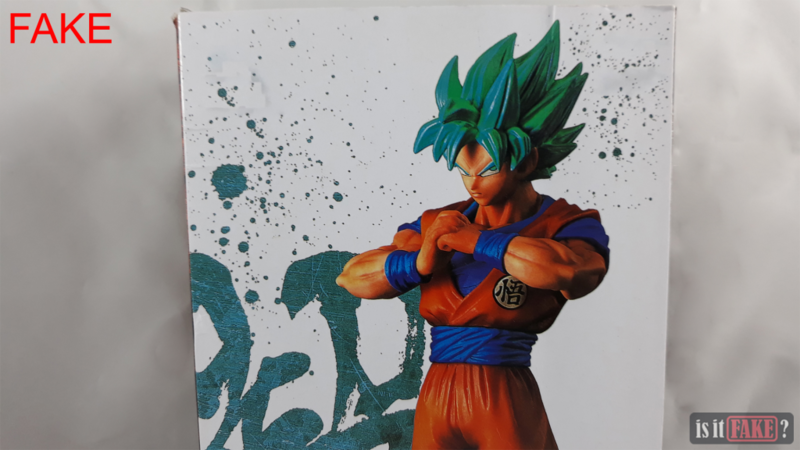 4 DXF figure collection had just been released last 2017, there are a lot of trusted online hobby stores that are selling the authentic figures. Banpresto may not have an online store but physical shops are spread throughout a lot of regions around the world. Those shops which are considered authorized by Banpresto can be found here. 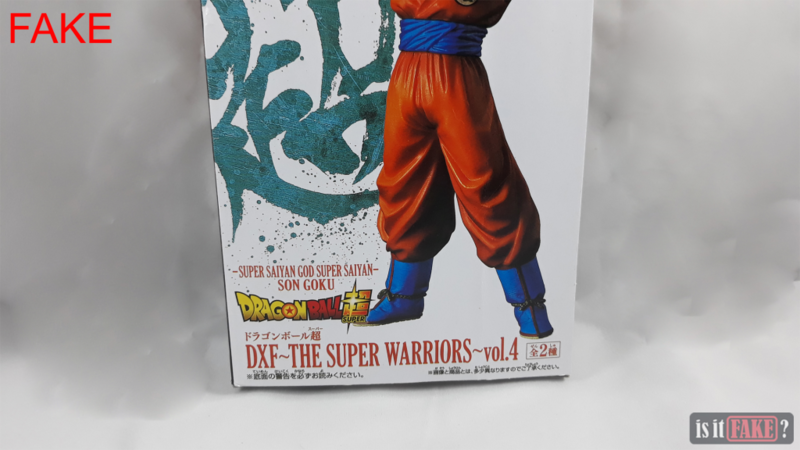 So if you’re nearby those authorized stores, might as well give them a visit for more DXF figure choices otherwise you may want to shop in trusted online hobby stores which we’re going to help you with. Luckily, we found a brand new figure stock still available at the BigBadToyStore. 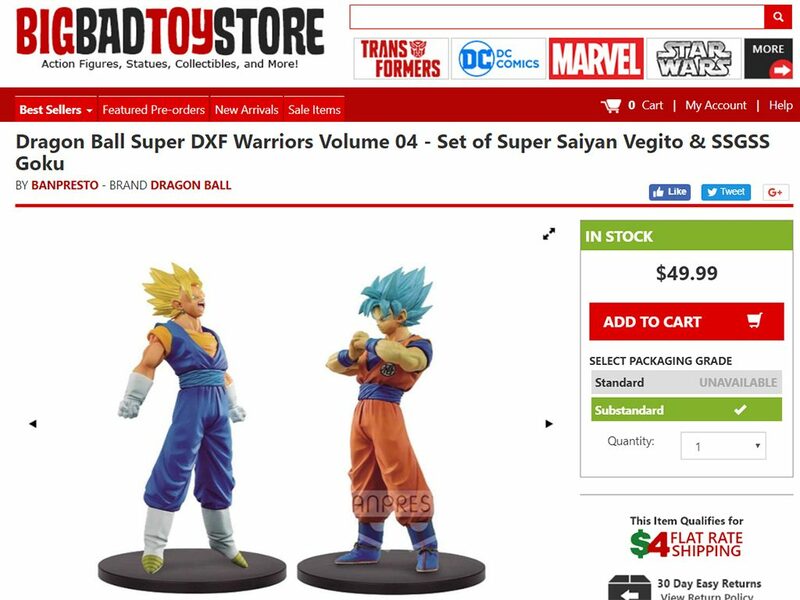 However, it’s sold as a set together with Super Saiyan Vegito as they’re originally go side by side in The Super Warriors Vol. 4 DXF figure collection. 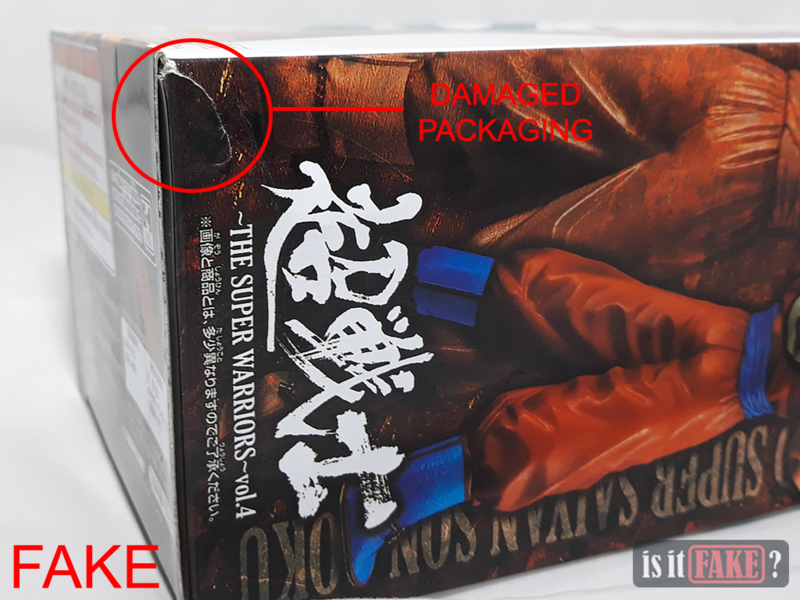 It also seems like the condition of the packaging isn’t good for display by itself according to the store’s package grading. 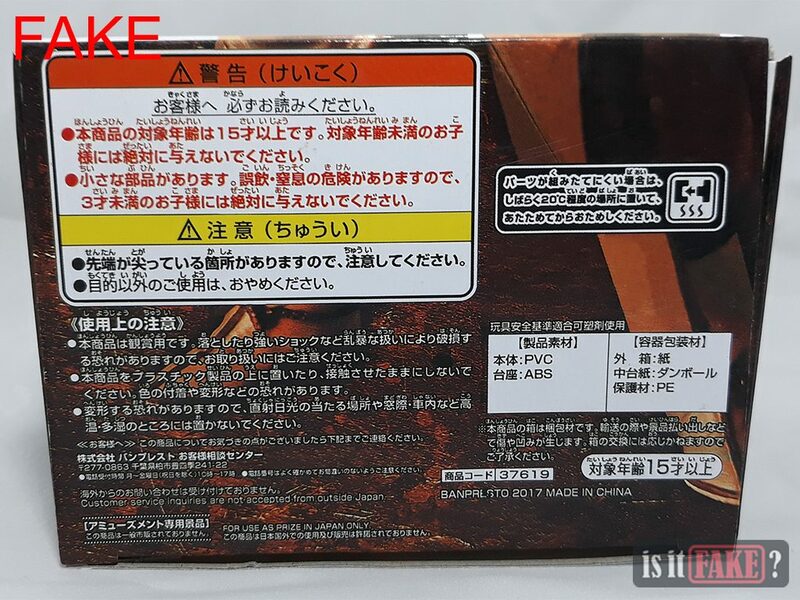 But at least, it’s still a fair warning and that the figure itself is guaranteed in pristine condition. 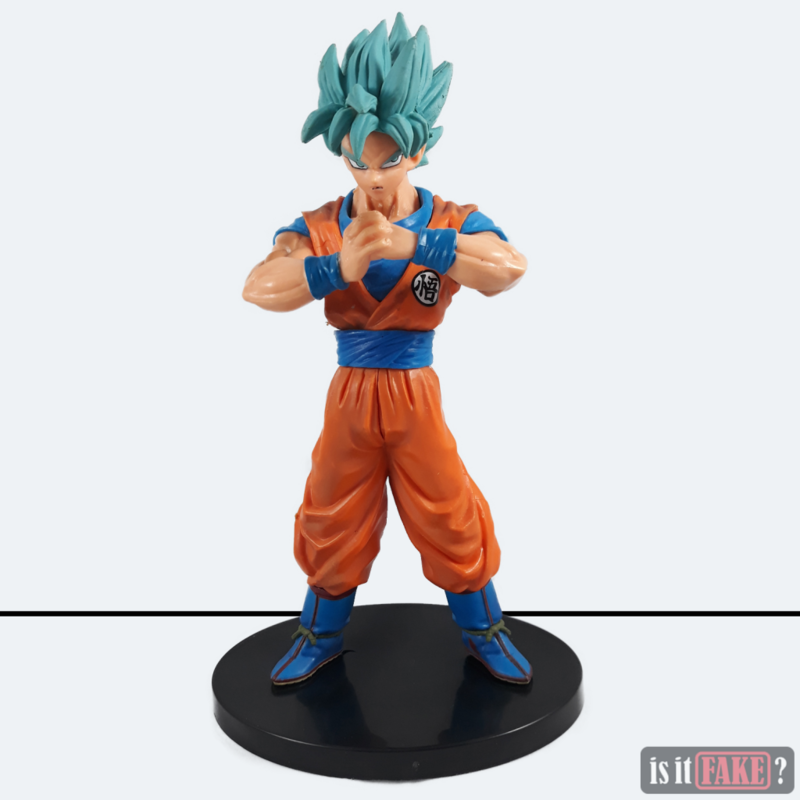 The figure collection is priced at $49.99 so basically you’re getting the Goku Super Saiyan Blue DXF figure for only less than $25.00. 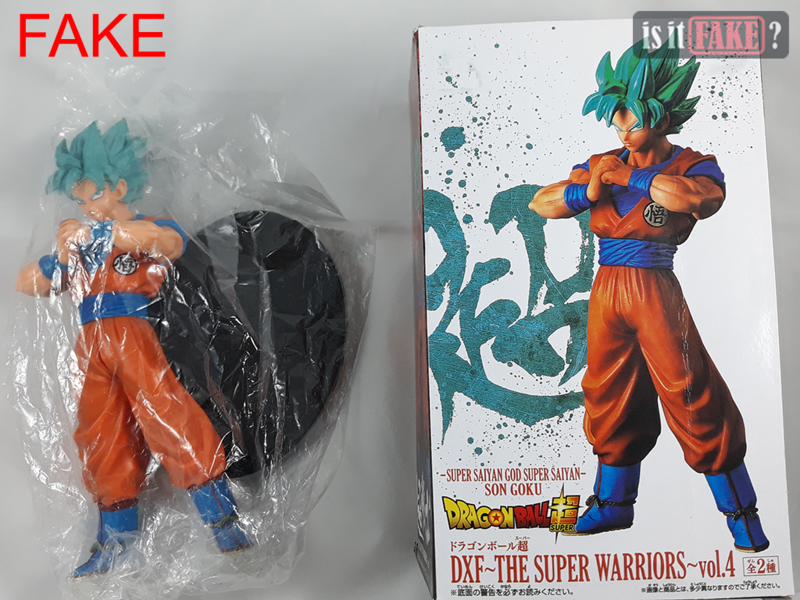 Another online store where you can get the authentic Goku Super Saiyan Blue The Super Warriors Vol.4 DXF figure is at Ninoma – The Japanese Market! It’s sold as stand-alone though it may be a little bit more expensive than the stock from BigBadToyStore. For $32.72, you might think that it’s a little bit more expensive than the one sold in Amazon Japan, which costs approximately $27.50 there, but it’s a guaranteed authentic stock at Ninoma. If you’re still wondering about Ninoma, they’re a Japan-based online hobby store that provides items fresh from Japan around the world. You may also want to check them out for newly released figures since they possibly have what other online hobby stores don’t. 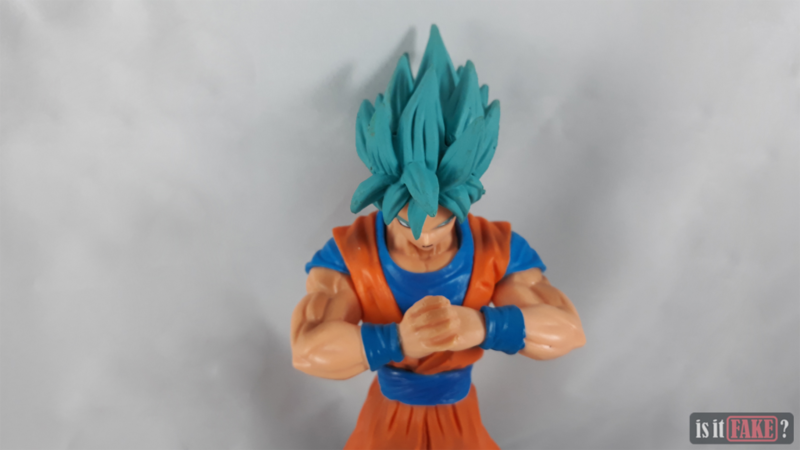 This fake Goku Super Saiyan Blue DXF figure deserves to be placed in quarantine for its harmful toxic materials on top of its deficient form and substandard details. 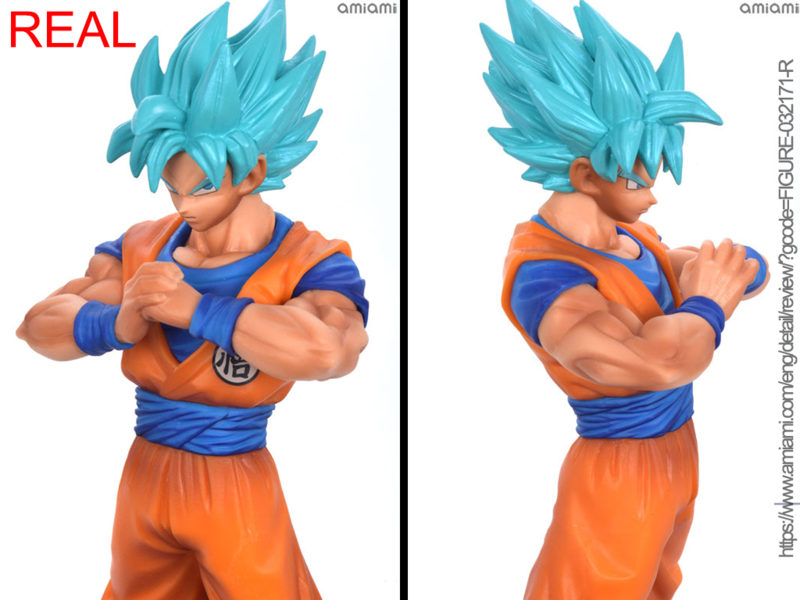 As much as it wants to copy the real deal made by Banpresto, it’s gone way down below to the ends of the abyss that is why we’re slamming the fake figure with an 80% terrible rating. 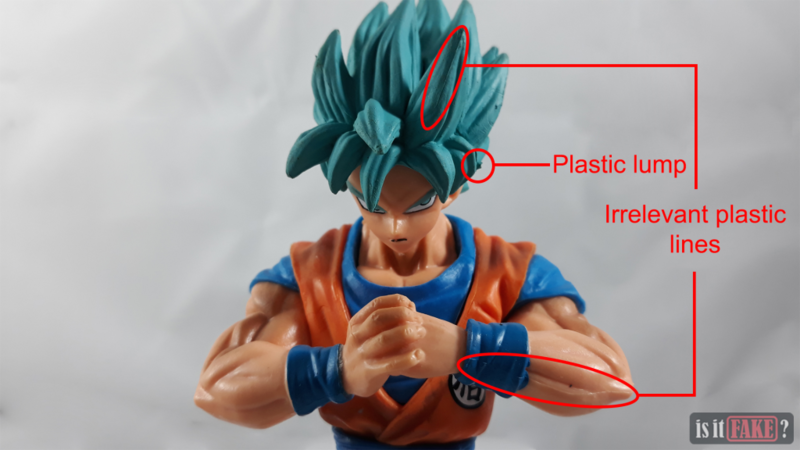 Watch how we unboxed this fake Goku Super Saiyan Blue DXF figure and be more wary with bootlegs in our Youtube channel. Don’t forget to leave a like, comment, and subscribe!